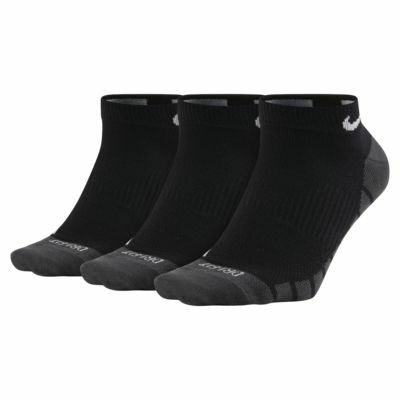 The Nike Dry Lightweight No-Show Training Socks feature sweat-wicking fabric and a compression fit to help keep your feet dry, comfortable and supported during your workout. Truthfully, the material of the socks is great. And it feels soft and comfortable. However, I just want to ask who can explain why the size of the socks is so weird? I ordered three pairs of socks in Middle Size. But why two of them are in middle size, and the other one is the small size? I compared the length of them, it is about 1.5cm shorter!! Anyway, I will recommend this product. Just remind everyone, "DO NOT FORGET TO CHECK THE SIZE BEFORE UNPACK IT"